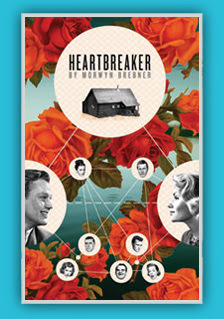 My pick at this years playRites Festival at Alberta Theatre Projects is Heartbreaker by playwright Morwyn Brebner. Each year ATP premieres four never-seen-before plays by Canadian playRites. This year those plays are Heartbreaker, Nisei Blue, The Romeo Initiative, and 300 Tapes. I have seen the first three and picked Heartbreeaker because it was outrageous...in a funny super random way. Lindsay Burns' character Ellen killed me almost the entire way through the show. Absolutely hysterical. Brebner is like the Seth MacFarlane of theatre randomness. I don't really know how to explain it...it is a combination of Brebner's words and Burns' delivery, but it is fantastic. I also liked that the father, who was supposed to be crazy, was wearing Crocs. What better way to say that someone is out of their mind than by putting Crocs on them? I cannot think of one. That was superb. I can't really say anything else about the play without giving anything away...but it consisted of a therapist, a crazy woman who takes shits in unoccupied houses, a father who shot a hippy, and an interesting and possibly surprising ending. The other two shows were also watchable although I was very squeamish at the height difference between the male lead and the two females in The Romeo Initiative...there were times when I thought he could be playing their child as he was so short in comparison. But that is a personal pet peeve and if that doesn't bother you then you would enjoy it. Nisei Blue was the best story of the three and would have been my pick had Heartbreaker not been so funny. The Enbridge playRites Fesitval runs from now until March 6. For more info go here.